The Pope’s visit will see an estimated 500,000 people attend Mass in the Phoenix Park on 26 August. 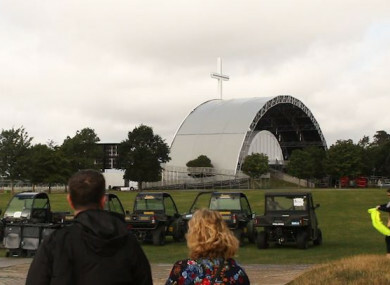 The stage where the Pope will take Mass in the Phoenix Park. THE HSE SAYS it is “not planning for deaths” during the Pope’s Mass, but are prepared for all “eventualities” that may occur. During a site visit to the Phoenix Park yesterday, Brendan Lawlor, the Executive’s chief emergency management officer, said they have plans in place for every possible situation, which also includes the setting up of a temporary morgue. There will be an estimated 500,000 people attending the Pope’s Mass in Phoenix Park for the World Meeting of Families on 26 August. There have already been discussions about infection control and the health of elderly citizens and those with medical conditions making the long walk to the main area. Lawlor advised that people need to engage with their healthcare provider if they plan to attend, adding that there will be alternatives to making the pilgrimage. “That’s a five-kilometre walk [there and] home and a long day for people. They need to assess their ability to take part in this event,” he says. Given the scale of the event – one of the largest in recent times – there will be significant security, transport and medical operations. On the medical side, Lawlor outlined how there will be vast differences to what was seen in 1979 when Pope John Paul II visited. That day, there were only three medical hubs in the park. On 26 August, there will 26 medical hubs from the bus zones and into the park. There will also be first aid responders in every carrel in the park, who will have the ability to call for advanced care if needed. Stabilisation units will be established in the park which can link to emergency routes to a number of Dublin hospitals. “We have to plan for every eventuality…just to ensure that everything is here and available,” concluded Lawlor. Although it is the largest event to be organised in Ireland in almost 40 years, Pope Francis himself won’t be fazed. In 2015, more than 6 million people attended his final Mass during a trip to the Philippines. In the same year, the Washington Post reported that his five-day visit to the US produced the largest security operation in US history. Email “HSE emergency chief: 'We're not saying there will be deaths but we're planning for that eventuality'”. Feedback on “HSE emergency chief: 'We're not saying there will be deaths but we're planning for that eventuality'”.